Cropped from full page text. 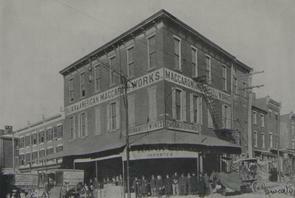 Italian & American Maccaroni Works building. Signs on building for "Foreign and native wines," "Frank Cuneo, Importer". Line of people standing in front, horses and wagons in street.